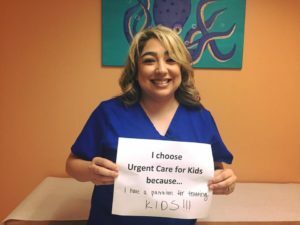 At Urgent Care for Kids, we’re all about kids! Meet Amanda, our friendly office manager in Houston. About you! What’s your official title at Urgent Care for Kids? How long have you worked here? Houston office manager, and I have been with Urgent Care for Kids for a year. What common illnesses/injuries do our physicians see more and more of as back to school season picks up? This happens when parents send children to school ill. Sometimes children do not tell their parents they are ill, and the sick child then exposes their germs to healthy children in the classroom or elsewhere. Are there any healthy precautions students can take? Parents? Always be sure to wash your hands and cover your mouth when sneezing or coughing. If a child shows any sick symptoms, like a fever, do not send them to school and seek medical care for further evaluation. When a family comes to Urgent Care for Kids, what can they expect as far as the level of expertise and customer service? We like to give our families a genuine and welcoming greeting when they first arrive. We also take care of every patient as if they were our own child. We have great providers that are very experienced in pediatrics and care deeply about the quality of care each patient receives. Our staff aims to answer all questions and concerns parents have so everyone feels well-informed and ready to get back on the healthy track. It’s our hope every experience here at Urgent Care for Kids is a great one! What permits an excused absence or school note if a child misses class because of an illness/injury? If the child has a fever, they can only return to school or daycare after they have been fever-free for 24 hrs. If they do not have a fever but start antibiotics due to a contagious infection, then they can return to school after taking antibiotics for 24 hrs. Additionally, a child can return to school after an injury, but they could have some restrictions on their activity level until cleared by their pediatrician or orthopedic doctor if it is recommended by the provider. What’s the wait time like at Urgent Care for Kids? Wait time on a steady day can be about 10 mins or less. We always try to keep wait times to an absolute minimum and offer a live waiting list parents are free to reference. Will Urgent Care for Kids notify the patient’s primary care pediatrician of the visit? Absolutely! We will automatically fax a visit summary from our office. What’s your favorite part about working at Urgent Care for Kids? The kid’s are my favorite part. Helping them get better is a passion of mine. Seeing children leave with a smile on their face lets me know they were taken care of by our staff. I also love making parents feel happy and well-informed. It’s our pleasure and privilege to take care of the kiddos in each of our communities!